Economic news often looks towards the future as investors try to predict both the best places to invest and avoid. Today’s successes are often overlooked as investors look for clear indicators of trends and future activity. Sometimes it is best to stop and look at the current environment, appreciate what is going well, and wait to judge the future. The overall U.S. economy is doing quite well at the moment and there is no reason to expect this to change in the near future. As earnings rise they change the price-earnings (PE) ratio for companies. This ratio explores how long it would take an investor to recoup their principal based on current company earnings. Low PE ratios mean investors can expect principal recovery much quicker, high PE ratios mean investors are paying a premium for stocks and can be an indicator of a bubble. 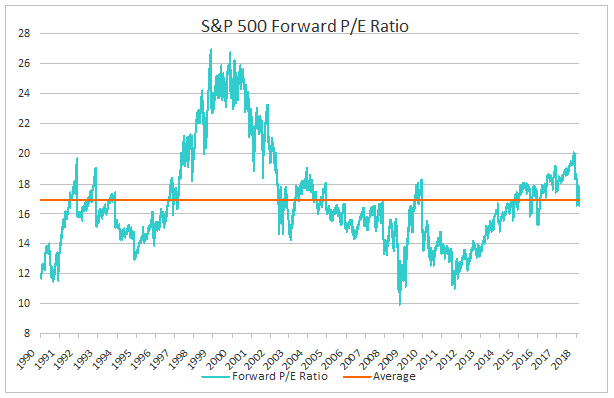 As you can see from the below chart, current PE ratios are right in line with the recent historical average. Finally, GDP is a good indicator of the health of the economy as a whole. 2018 first quarter GDP stands at 2.3% versus 1.2% for the first quarter of 2017 and 0.6% for the first quarter of 2016.2 The first quarter tends to be the low figure for the year, so it can reasonably be expected that GDP will increase before the end of the year. If the key metrics noted above are all positive, why the fear and worry in the news? The first reason would be inevitability. The stock market will eventually see a decline. It goes through up and down cycles, meaning wait long enough and you will see prices fall. One should pay attention to changes and not expect good times to last forever. Let’s explore a few topics of worry in the news recently. A good place to start is the slow ratcheting up of interest rates by the Fed. The above graph is a chart of the 10-year Treasury rate over the past 50+ years (recessions noted in grey). 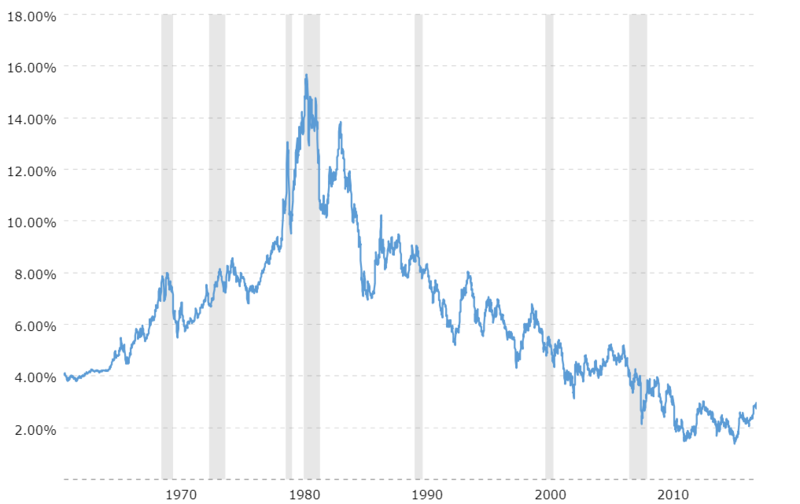 As you can see, we are currently in a period of historically low rates. It’s also clear that we had higher rates in the 1990’s, a time of good performance by the stock market. A rise in rates tends to slow housing sales and some business expansions as credit tightens. However, these will be slow changes that are already widely expected and factoring into the decisions of families and companies. Interest rate rises have been slow, and are expected to remain so. Slow change allows for adjustment and is not the same as an unexpected market shock. Interest rates are not expected to rise to a level that will prohibit borrowing, but rather to return to more historical norms. This is good news for savers and an anticipated change for future borrowers. Other articles point to a few large companies lowering guidance as a sign we’ve reached peak earnings. It’s true that Caterpillar recently noted 2018 earnings may be their best and 2019 will likely be lower. At the same time, Boeing both had good earnings and upwardly revised estimates through 2019.5 The fate of one company is not the fate of the economy as a whole. Aggregate S&P 500 earnings estimates for 2019 have been revised upwards as companies release figures and give forward guidance. That means companies generally do not see 2018 as a year of growth plateau, but rather as part of an upward trajectory that is expected to continue into 2019. The last area of worry for some pundits is both wages and inflation. We are seeing an uptick in both categories. These are areas to watch for future developments that may provide drags on the economy. We’re not there yet though. Inflation remains at about 2.0%6 and wage growth is still at a lower rate than before the recession7. Rising wage growth and inflation can be expected to limit the acceleration of economic growth, but are not expected to be a drag on the economy. Some clients reading this may be wondering why their portfolios are not skyrocketing upwards given that the economy is doing well. The stock market is considered a leading indicator and typically moves in advance of economic news. The S&P 500 was up every month in 2017. That is unusual. Much of the good news noted above has already been priced into the market, allowing account values to increase in 2017. The 2018 market is expected to increase more slowly, with more volatility than 2017. Investors are looking to sell companies that have not benefited as much from economic growth, capture gains, and move on to other companies with rosier outlooks for the year. The overall U.S. economy is doing quite well. Persons looking for a job can probably find one with relative ease. Borrowing costs remain historically low. Companies are making money and looking to make more over the next year or so. Of course, the market will eventually change and we will continue to watch for indicators of that change. The information contained in this newsletter is for general use, and while we believe all information to be reliable and accurate, it is important to remember individual situations may be entirely different. The information provided is not written or intended as tax or legal advice and may not be relied upon for purposes of avoiding any Federal tax penalties. Individuals are encouraged to seek advice from their own tax or legal counsel. Individuals involved in the estate planning process should work with an estate planning team, including their own personal legal or tax counsel. Neither the information presented nor any opinion expressed constitutes a solicitation of the purchase or sale of any securities.